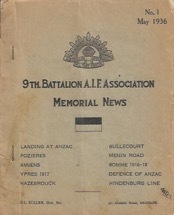 The Fighting Ninth was the official journal of the 9th Battalions AIF Association - that's the original 9th Battalions Association, the soldiers who were First Ashore at Galipolli and fought through the trenches of France. - the first issue was published in 1947 and it continued almost unbroken to 1987. I spent nearly 14 years as both Secretary of their Association and Editor of their magazine from 1973 to 1987. There are 40 issues of the magazine with a host of individual articles written by First World War soldiers who were 'actually there'. It gives many first hand accounts of unmatched authority and clarity. The process of scanning and uploading even a small fraction of the content will be long and arduous so please bear with us as we embark on this journey. lt was once again a privilege for me to marshal the Ninth Battalion contingents into what has come to be fondly known as “The Ninth Column”. This custom of recent years has particular meaning to all who have been associated with “The Fighting Ninth” in one or more of its forms. Three generations of the Ninth, marching off to the strains of “EI Abenico”, presented a significant and stirring spectacle. The Column will be complete when the newly formed Pipes and Drums of 9 ROR make their inaugural appearance. Pride of place in the Column will always go to the remaining members ofthe 9th AIF - the “Old Ninth". I never cease to marvel at the fortitude and erect soldierly bearing of these elderly gentlemen who, as mere youths over sixty years ago, stormed the beaches of Gallipoli and suffered through the trenches of France. They serve as a constant reminder to all Australians of the nobility and spirit of sacrifice with which the flower of Australian youth responded to the callfor aid to the Empire. Men like Clarrie Wrench, Neville Hatton, Ernie Dearden, Bill Cleaver, Theo Henzell and others, who marched with such obvious pride and dignity, presented a picture which evoked emotional responses and appreciation from the spectators. The spirit of the “Old Ninth" was in no way dimmed in the 9th Moreton. Their exploits in the Second World War added a glorious chapter to the Ninth history, and their pride in their battalion was evident in their lightness of step and impressive bearing. Men like George Barker, Stan Ives, Jack Capper, Happy Chapman, Len Jones and others were worthy representatives of their battalion. The “Old Ninth" Banner preceded the Column, borne in a very regimental fashion by six immaculate sergeants of 9 RQR. Major Garry Babon, OC Spt Coy, commanded the 9 ROR Colour Guard, with Lt Doug Hastie, Mortar Platoon Commander, as Colour Ensign. Many compliments were paid by spectators as to the impeccable turnout and high standard of drill achieved by the Guard. A measure of their performance was the substantial increase in spectator appreciation as the Guard passed along the route. An observation worth making is that in addition to the March, the Guard had, almost to a man, attended the Dawn Service. The usual post-March functions were held at Gona Barracks, with all Messes dispensing hospitality and good cheer. An attractive smorgasboard luncheon was provided by the cooks of 9 RQR under WO2 John Pickers, and the convivial reunion of old comrades was a fitting end to another memorable Anzac Day. Only one copy ever found and possibly only one ever produced. The date is May 1936. The Fighting Ninth resumed annual publication in 1947 and continued to 1987.